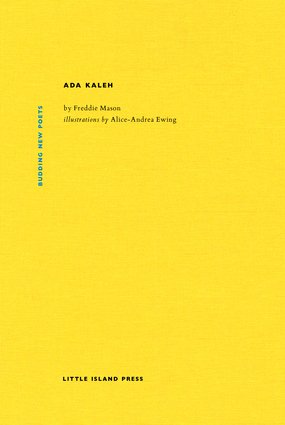 Through its two mysterious sections, Ada Kaleh keeps returning to what cannot be returned to: a shared history, the memory of which has been obliterated, the shape barely implied by shadows. In voices of catastrophe, calmness, longing, and frustration, this brilliant poem opens out onto the collective experiences of interference that take the place of what you really need to remember clearly but can't. There are teeth, police cars and film crews. From East Finchley to rivers in Finland, fires in the middle of vegetables to plants in the desert at night. Not since Samuel Beckett's Whoroscope has there been such a confidently unhinged poetic debut written in the English language. Stunningly illustrated with drawings by artist Alice-Andrea Ewing, Ada Kaleh stretches and contorts language into an unsettling monody for our shared addiction to remembrance. Alice-Andrea Ewing trained as a founder-sculptor working in the Italian Lost Wax method. She has exhibited around the UK. Freddie Mason lives in London and studied at the universities of Sussex and Cambridge. He is currently a PhD candidate at the Royal College of Art in London.